Today I was listening to this cd for the first time in ages. I can hardly believe it has been so long as there was a period of about four years in my life when I listened to little else. I got hooked on Dave Matthews Band in high school and my love only grew when I went to college and to my 1st concert, 2nd concert, 3rd, 4th... The music just makes me happy, makes me want to dance (and I don't dance!) It also brings me back to a really good period in my life. Ah, the power of sound. As I listened to this cd today I got to thinking about all the great albums I really love and have decided to do a series on them. 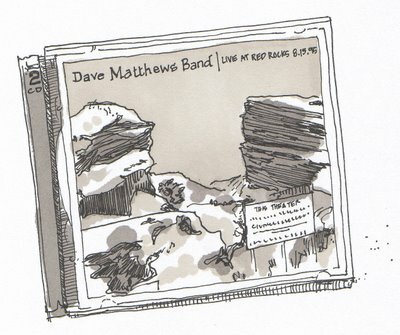 Of all the DMB albums, Live at Red Rocks is my favorite as it is 2 disks of complete chill...just perfect for any occasion. Love it. I can't pick a favorite song because the whole album is so darn good. Hey - I have this one and recognized it right away. Great drawing. I like the grayscale. I like it (the drawing) too. I wondered if you were drawing drawing your own design of what the album cover could be, or the real album cover. I think it would be interesting to see how you'd design it, given your connection to the music. Melissa- I think it is so much funner to color in grayscale. It really takes the pressure of getting a perfect match and I am better able to focus on values. Jana- That is a great idea. Perhaps I should do both. Hmmm.